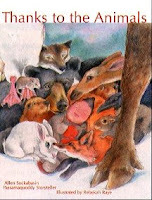 On January 2, 2007, I posted Beverly Slapin's review of Allen Sockabasin's terrific picture book, Thanks to the Animals. Sockabasin is Passamaquoddy. I reread his book yesterday, looking over the Passamaquoddy words included on the last page. I also learned that you can listen to Sockabasin and his daughter reading the story aloud. She reads a line in English; he reads it in Passamaquoddy. When you're developing lesson plans for the wintertime, plan on using Thanks to the Animals, and teach your students about the Passamaquoddy people. They're in Maine. Click here to go to the tribe's website. Read through their "History" page. Too many people think Native peoples were primitive, but the fact is, we were recognized as Nations and as such, entered into diplomatic and trade relationships with Europeans. In spite of efforts to 'kill the Indian and save the man,' Native peoples are still here, and you may be surprised to know, we've got our own governments and services. The Passamaquoddy's, for example, have a police and fire department. Imagine the power of sharing that information with readers who think that Native peoples no longer exist! This is definitely an example of a right way to integrate American Indian culture into homes across America.